I've blogged some giveaways and product reviews for Two Horse Tack -- do you remember my halter review, an the recent bridle giveaway? Well, they've been great folks to work with, and recently I learned about Two Horse Tack's charity support. If you go to their site you'll see a wonderful variety of horses that are used as models. In fact, many of their models are rescue horses! For rescue horse models, they do a photo shoot and then sell the item donating proceeds to the charity itself. For example you can buy the halter to the right and 100% of the proceeds go to the Exceller Fund. See their charity product listings which include the Exceller Fund, New Vocations, and the Kentucky Equine Center. They also have a program where if you donate to one of their charities (as little as $5! ), you will receive a $10 gift card. That's a great deal! 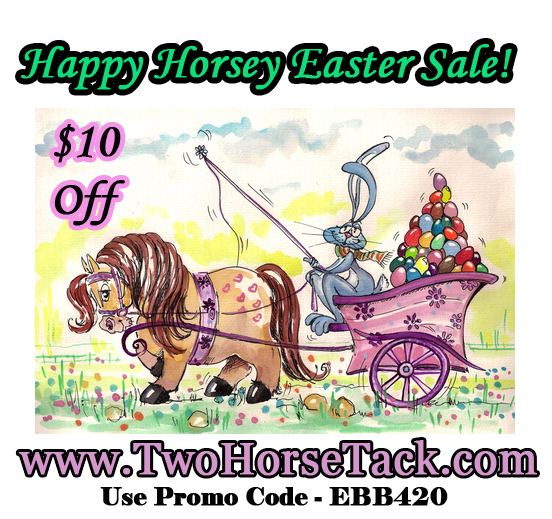 Two Horse Tack is also doing an Easter sale. Use the coupon code below through April 30 for $10 off. Happy Easter!